A knitters’ question which arises perenially is, “how much wool shall I buy?” To this question there is no blanket-answer, but several qualified ones: if you are using very thick wool, buy more than you could possibly imagine; if you are using very thin wool, buy surprisingly little. The rule of thumb is that five or six 4oz skeins of knitting worsted is about right for the average adult sweater; that is, 20 to 24 ounces. A really massive sweater, in giant wool, at perhaps 2.5 stitches to 1″, may take two pounds of wool, or even more. If you are using Shetland (or any wool of comparable thinness, knitting up at around 6 stitches to 1″) you can usually get away with 10 ounces for an average sweater. And when I say Shetland, I mean study the label carefully. If it admits to enfolding a yarn of only 5% Shetland, even its manufacturer must agree that it is hardly Shetland at all, and should not be counted as such. It is also sometimes quite a bit thicker than real Shetland. 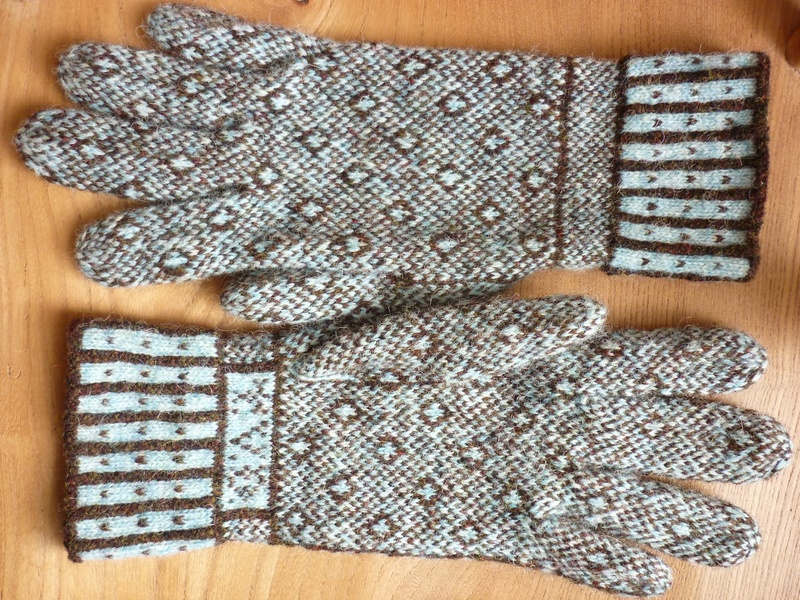 Tom’s first Sanquhar Gloves in Shetland wool, you can read a bit more about these gloves here.